These are not just random events. 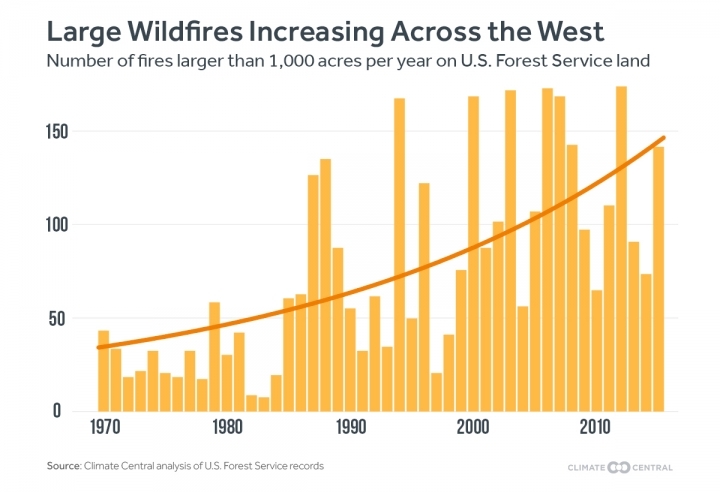 Climate change is producing conditions ripe for wildfires, tipping the scales in favor of the dramatic increases in large wildfires we have seen across the West since the 1970s. Snowpack is melting earlier as winter and spring temperatures rise, and in most states an increasing percentage of winter precipitation is falling as rain, meaning there is often less snowpack to begin with. Summer temperatures are rising, particularly in Southwestern states, where the number of extremely hot days is steadily increasing, creating more days where forests and grasslands are dried out and ready to burn. In 2015, far below-average snowpack in California and the Pacific Northwest created exceptionally dry conditions across the West, and the region experienced fires of a size rarely seen. Washington’s Okanogan Complex fire was the largest group of fires on record for the state. And multiple years of searing drought in California contributed to several fires that were among the state’s top 10 most destructive fires on record. A Climate Central analysis of 45 years of U.S. Forest Service records from the western U.S. show that the number of large fires on Forest Service land is increasing dramatically. The area burned by these fires is also growing at an alarming rate. Across the Western U.S., the average annual number of large fires (larger than 1,000 acres) burning each year has more than tripled between the 1970s and the 2010s. The area burned by these fires has shown an even larger increase: in an average year, more than six times as many acres across the West were burned in the 2010s than in the 1970s. The fire season is 105 days longer than it was in the 1970, and is approaching the point where the notion of a fire season will be made obsolete by the reality of year-round wildfires across the West. The average number of large fires burning each year on Forest Service land has increased at least 10-fold in the Northern Rocky Mountain states of Wyoming, Idaho, and Montana. In the Pacific Northwest, there are now five times as many large fires burning in a typical year in Washington as there were in the 1970s; in Oregon there are nearly seven times as many. And the conditions are likely to get worse in the next several decades. Climate Central’s States at Risk project analyzed historical climate data and downscaled climate projections from 29 different global climate models. We found that in most western states, the climate conditions that can stoke summer wildfires are projected to increase substantially in the relatively short period between now and 2050. 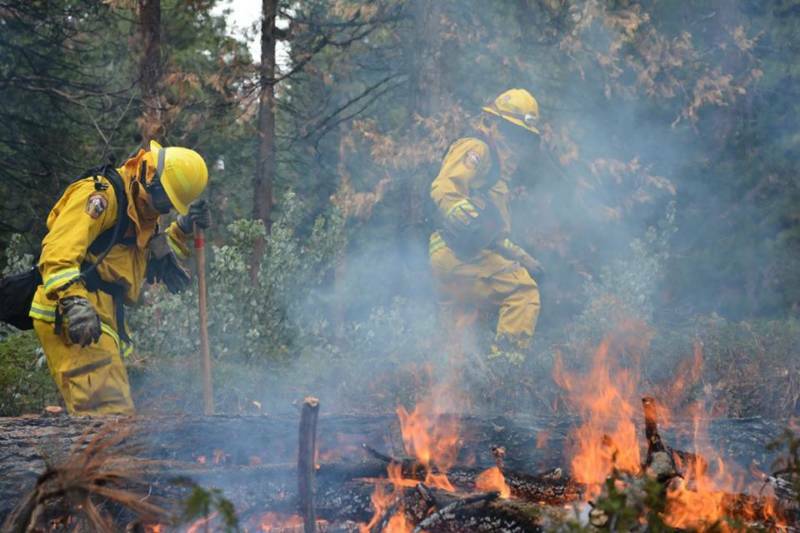 Arizona is expected to see more than a month of additional high-risk fire days by 2050. This analysis relies on the Keetch-Byram Drought Index (KBDI), a measure of the dryness of the top 8 inches of the forest floor, which serves as a proxy for the dryness of forest fuels. KBDI is one of a number of indicators of wildfire potential, but is commonly used by the U.S. Forest Service (along with other tools) to predict fire danger. The scale runs from 0 to 800. Our analysis found that the number of days with KBDI above 600 (a level at which the potential for wildfire is high) would increase significantly between now and 2050 in 10 of the western states if greenhouse gas emissions continue unabated. Across these 10 states, the total number of days with KBDI above 600 is projected to increase 46 percent between 2000 and 2050. Although many factors influence the ignition and spread of wildfires, our KBDI projections suggest that the conditions suitable for more and larger fires will increase in the near- to midterm. This finding is consistent with other research on wildfire potential and burning.